Editor's Note: This article appeared in the June 2012 issue of the Arkansas United Methodist newspaper, entitled "Church near Air Force base reaches out to military community." You can download the original pdf here. provided by members of First UMC Jacksonville. Prayer and food. Two simple provisions that can give comfort and support to someone in need. For one church, the two items have become part of the foundation for reaching out to families living and serving within the Little Rock Air Force Base community. 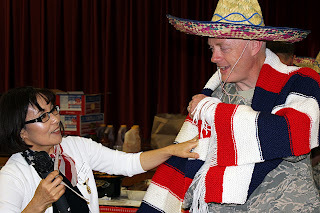 In May, volunteers from Jacksonville UMC combined the two acts by providing a taco dinner, complete with a smorgasbord of homemade desserts, and approximately 225 prayer shawls for families attending the Deployed Airmen’s Family Dinner. It’s all part of the church’s military family outreach—a ministry organized in part by the spouses of retired military personnel and veterans, under the direction of the Rev. Naomi Rogers, associate pastor for military families. Rogers said the church has a rich legacy with the base. Approximately 200 people attended the Deployed Airmen’s Family Dinner, including the families of those deployed overseas and members of the base command staff. Organized by the base chaplain’s office, the quarterly event not only offers a meal, but also brings together a variety of services a family member may need to use during a deployment. The meal, provided by a local ministry or group, is served to those in attendance by members of the command staff. In preparation for the May outreach, Rogers challenged members of the church’s prayer shawl ministry to create more than 200 shawls to give away at the meal. Dotty Heckenbach said this was the biggest project the prayer shawl ministry team has undertaken since its formation in 2005. One member, who lives out of state, created more than 20 shawls for the effort. Heckenbach said the effort was a “labor of love,” from prayers over each stitch as the shawls are created, to the prayers given as a shawl is placed around the shoulders of a recipient. Lydia Baldwin received one of the church’s prayer shawls when her husband, Joel, deployed last year. She said the purple shawl helped bring her comfort during a vulnerable, emotional time. Since receiving the shawl, Baldwin has become part of the First UMC Jacksonville community, and helped with additional outreach efforts to the military community. Rogers would like to challenge members of First UMC Jacksonville, along with churches throughout the Arkansas Conference, to create an additional 800 shawls, so more than 1,000 shawls can be distributed by Christmas. She suggests using a “victory” pattern, using a red, white and blue motif. The design and colors provide additional meaning to the shawls. For more information about the prayer shawl ministry, and the church’s outreach to the Little Rock Air Force Base, contact Rogers at naomi.rogers@gmail.com or 501-982-8176. Hutson serves as director of children’s ministries for St. James UMC Little Rock.